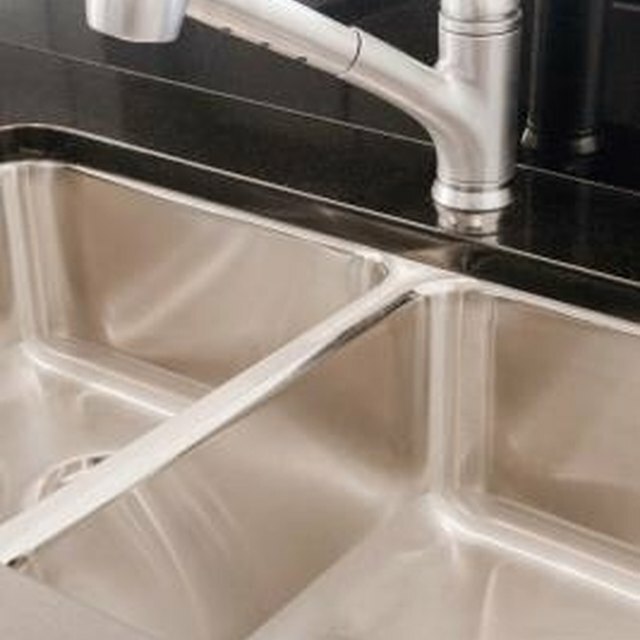 Single-handled kitchen faucets are built using several parts that seal the faucet from leaking. The washers, O-ring and faucet body all work together to shoot water from the faucet end without spilling out of the sides. A grinding sound from the handle when turning it, or a loose handle, may indicate the inside parts are starting to wear away and a leak may soon form. When replacing any faucet components, order new parts from the faucet manufacturer or bring the faulty parts to a home center for a suitable replacement. Single-handle faucets are sealed by washers that keep water from leaking. Turn off the faucet water supply underneath the sink. Lift up the handle to release all of the water from the pipes. Slide an Allen wrench -- sometimes called an Allen key -- into the small hole underneath the handle. Turn it counterclockwise to remove the screw. Pull off the handle. Wrap the ends of adjustable pliers with tape to protect the plastic cap ring underneath the handle and turn it counterclockwise to remove it. Lift off the plastic cam and packing, and lift up the ball. Inspect all the parts for cracks or broken components. Remove the seats and the springs, and replace parts as necessary.